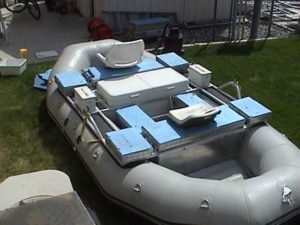 There is lots of equipment available to white water enthusiasts and one of the pieces of equipment rafters may want to consider is a rafting dry box. In addition to bags that will keep your gear dry there are also rafting dry boxes that seal up tight to keep your food, clothing and other gear that does not deal well with water safe and dry. It is so important to have something you can count on to keep your gear dry if you are staying over night in the forest along a raging river. Fortunately there are lots of solutions to keep things dry. In an earlier post we discussed Dry Bags and you might want to take a few minutes to read that post as well before you decide that buying a dry box is the solution for you. Both dry boxes and dry bags have their advantages, however depending on your situation and your raft one solution can be better than another. A typical dry box that is used by rafting companies and individuals is shown on the right. This particular one measures 13.5 inches wide by 15 inches deep by 26 inches long. It is not a large box, however it can store all of your essentials that you need to get your camp site going at night. Besides the larger the box, the more things you will likely take with you. Small is often better! Even if everything else is wet, emergency matches, flashlights a quick change of clothes can be stored in this box to get you going. Once that fire is going, you can quickly dry out and more importantly get something hot to eat and dry your clothes out. It can be extremely important to have a warm fire at night to avoid hypothermia setting in. Rafting dry boxes come in a variety of sizes to meet all of your needs and can be tailored to the size of raft and the number of people who you have in your group. Sometimes it is better to have a number of small boxes than one large rafting dry box. They are just easier to carry and certainly not as heavy. Even if you have several small boxes, they will be extremely appreciated at the end of the day. Forgot about lunch! You may be only on a day trip with a pick up at the end of the day and plan to lunch along the river somewhere. If it gets wet, it is going to be a long day and everyone hungry at the end. A dry box packed with your lunch and snacks is the answer for many rafting companies or individual teams. There is nothing better after a mornings rafting than pulling up along a beach in a bit of calm water and arranging for a picnic along the river. Make sure that you enjoy yours by being prepared and using a dry box to pack your lunch and other things in such as electronics, matches and an extra set of clothes. White water rafting can be a lot of fun, however like many sports, they can easily be ruined if you are not properly prepared and have the right equipment. In this post we have focused on dry boxes, while in an early one we focused on dry bags. Which ever you use, make sure that you have all of the right gear to make your trip enjoyable. Plan your trip in advance including the raft you will use as well as the gear you take along to be comfortable both on and off the river. If you have a piece of white water gear that you find particularly useful, why not let our readers know about it. We will even write a post about it if it is something you feel pretty strong about.